I’ve now survived a whole month riding around this maze-like, traffic choked city with just one minor bump into the back of a stiletto-clad woman’s scooter. Oh, not to mention several trips to the garage (paid for by Mr Nguyen) to stop the engine from screeching and one flat tire which was repaired in minutes by a tiny Vietnamese woman wearing pyjamas who darted out of her Pho shop with a bucket of tools when she saw me wheeling my bike past. Although Hanoi is nothing compared to Ho Chi Minh City, it’s still a big step up from the quiet roads of Dalat and sleepy Pai in Thailand. So, what have I learnt? 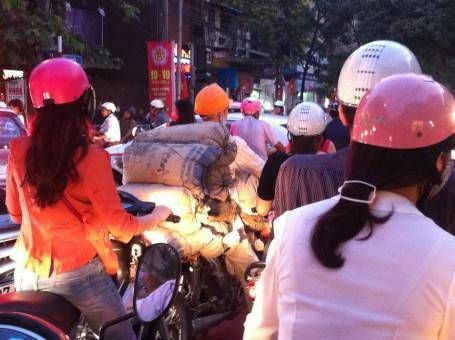 Riding a motorbike in Hanoi is no easy task. Other drivers are your biggest obstacle, especially when they race past you, don’t bother indicating, squeeze into the tightest of spaces and tend to stare at their phones rather than the road. The up-side is that we generally travel at around about 20kph so there’s enough time to avoid most hazards. Don’t check to see what’s behind you, just go, you are only responsible for what is directly ahead of you. In the hierarchy of traffic, a motorbike is only better than a bicycle, which is only slightly better than a pedestrian. Since cars and buses are clearly more important don’t expect them to even notice you, let alone make room for you. Don’t bother checking your mirrors, or replacing them when they get knocked off. Use your horn at least 2,000 times per mile. Use a phone while you drive, it makes the journey more of a challenge. Overtake or undertake just before turning. Use a helmet to protect thin air – hang it on your handlebars or keep it in your seat but don’t bother putting it on your head. Red lights, what red lights? Beep at anyone who has the audacity to actually stop for the traffic lights. Make sure you know “the Boss” or at least someone who knows him in case you are stopped by the police. See how many people you can fit onto your bike, particularly small children; teach babies to cling on to the handlebars from an early age. If a space looks too small to squeeze through, go for it. Look out for cars heading straight towards you in your lane. Head the wrong way down one way streets. If you’re a woman, keeping the sun off is important so get yourself a flowery mac to blend in. See what you can fit on your bike, go on, be creative – a dog, ladder, a TV, a chair, a gas bottle? Swerve at the last minute to avoid manhole covers and pot holes. Don’t worry about getting a flat tire; you’ll never be far from a Vietnamese woman with a bucket-full of tools who’ll be willing to repair your tire for just £1.50! Finally, if you crash you’ll likely do so in slow moving traffic so just give the other driver a glare and get straight back on again. This all sounds pretty awful but despite some appalling driving habits the road system in Vietnam actually works remarkably well. At first glance the traffic may look like an utter mess but actually, the chaos is kind of organised; like shoals of fish, motorbikes swerve around obstacles in unison and bikes slow to avoid collisions. 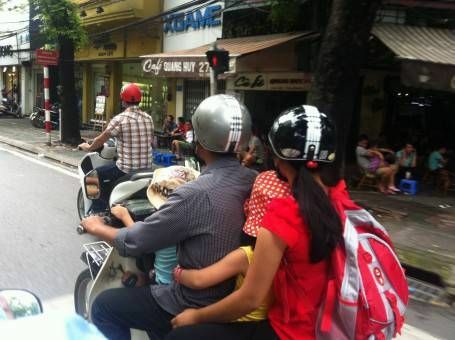 Vietnam is also one of the countries in Asia where we’ve seen most people wearing helmets and haven’t witnessed any major crashes since we’ve been here. There are times when I think: ‘If I was cycling in London and someone did that to me I would be so mad,’ but then I beep my horn, shrug my shoulders and get swept along with the shoal. I think I might just be adapting to this Hanoian style of riding. Have you ever ridden a motorbike in Vietnam? Would you be brave enough to try? Haha! I love this post. 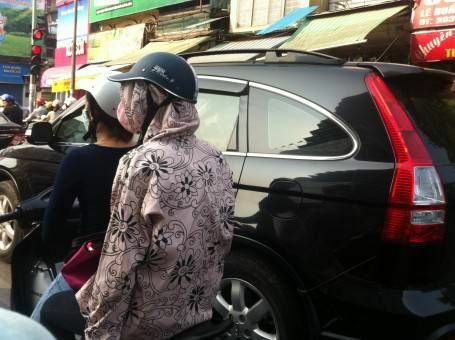 You are incredibly brave getting on a bike in Vietnam. Like you said, the traffic does appear to move like a shoal of fish, but I can’t imagine ever being able to work that out enough to join in! How do you get on with missing the pedestrians crossing? I found that terrifying! The best thing we saw on the back of a bike (in Hanoi, funnily enough) was a VERY large pane of glass; the guy on the back holding it had his arms spread quite wide to keep it steady. I was speechless. What a great article, guys! I remember learning how to drive a scooter in Vietnam and it was nerve-wrecking. The traffic is insane! Well done for navigating your way through the swarm. Top tips indeed my friend. The ladder is my favourite and a sight I saw many times in India. Imagine popping to B&Q on a moped to buy a ladder… Odd. Haha, love it! Though this sounds absolutely terrifying to me, I really want to rent a motorbike to travel in Vietnam. Never been on a motorbike before and a bit of a wimp on the road but hey, will give it a go! Perhaps the roads are less crazy outside the cities though? I thought the people riding bikes in Bangkok were prety mad, but sounds like Vietnam is even worse. You are very brave to face up to this challlenge. Your tips made me laugh. 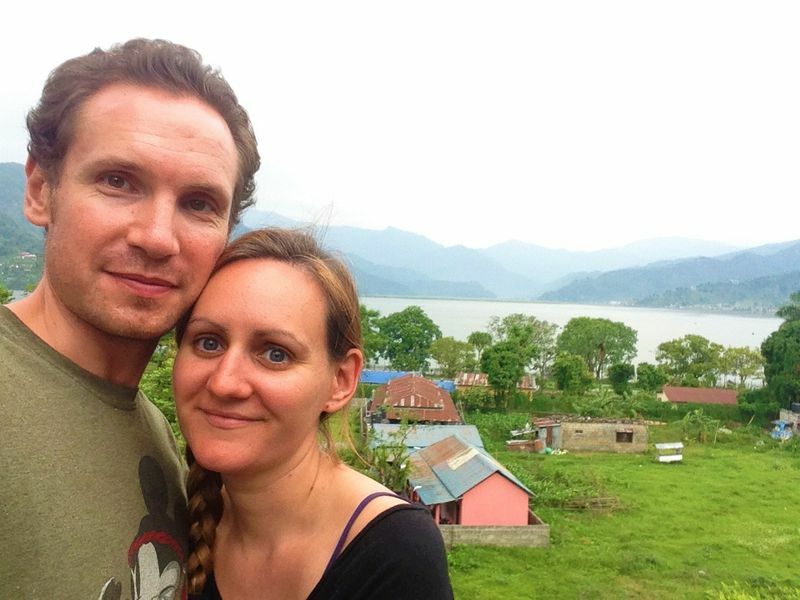 I went to Vietnam on honeymoon and my husband rode us around in a few places… You’re right, it’s not as chaotic as it looks once you’re in it and the shoal thing works remarkably well. I also found as a pedestrian that crossing the road was initially scary but if you just go for it the traffic tends to move around you. You might get beeped at but its not because of an angry driver (like in the UK), they’re just letting you know they’re there! Happy biking! 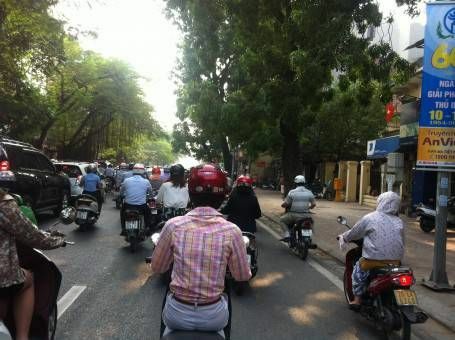 Traffic in Hanoi looks crazy, dangerous but actually it’s quite safe because everyone ride/drive slowly and carefully. What's the cost of living in Vietnam? 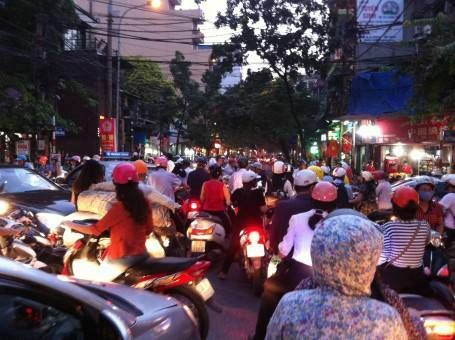 Ahh so much crowd in Hanoi still people visit there for motorbikes tours which is affordable and adventurous. Hanoi traffic looks crazy but people are so calm on the road. I feel so funny looking down from coffee shop. My head turn left and right like table tennis watching. Yeah, that’s so true, the traffic seems chaotic but everyone seems so calm! We rode Hanoi countryside on dirt bike, just 15 mins from outskirt then we see no more traffic and the scenry is so amazing. 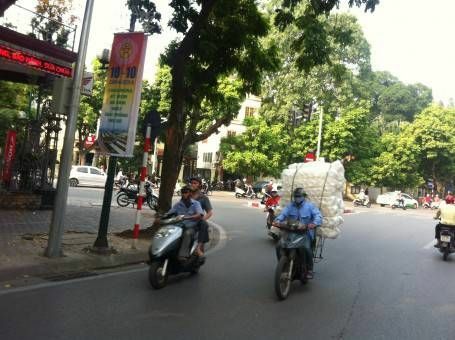 Hanoi traffic during the rush hour is so funny. Yep, you’re right, the further out of the city you go the calmer it is. Although you do sometimes get some crazy drivers out in the countryside too. Where abouts did you ride? We are trying to find a quieter place to ride for the first time ! I can’t remember the exact location, but it was between the Old Quarter and the Mausoleum. Good luck! This looks like so much fun! 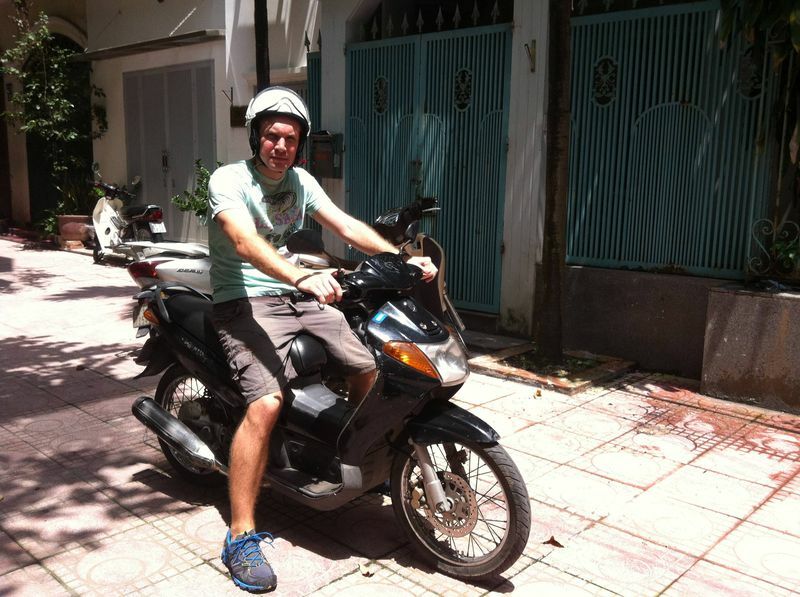 I did the moped thing in Hanoi, and I remember wondering if it was humanly possible to have that much fun. Yep, it’s definitely an experience, that’s for sure!